Yser On Ne Passe Pas! I could have sworn I had shown you this beautiful little bronze medal years ago, but it appears not, from what I can see. Anyway, even if I have, who cares? 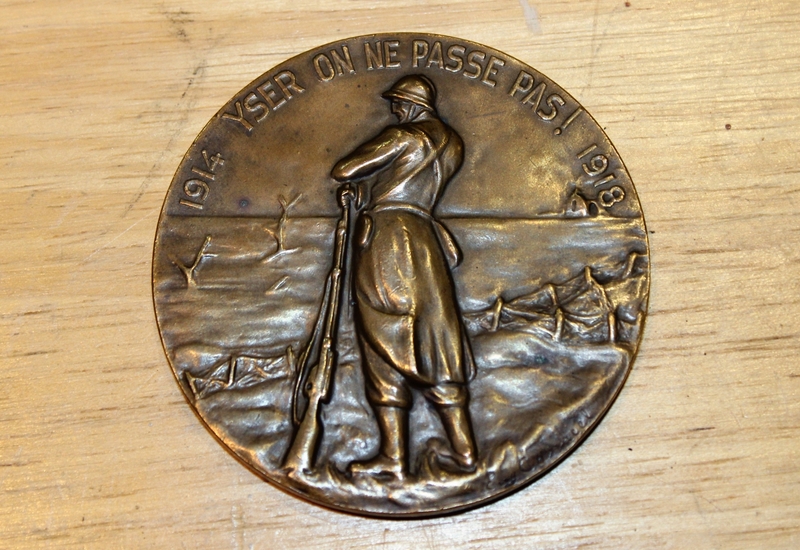 It’s three inches in diameter, so a little smaller than these images, and was made available in Belgium in the 1930s, in both bronze & silver, to old soldiers who had received the ‘Carte du Feu’ – the Card of Fire – which was itself only awarded to those who had fought in the front lines on the Yser – the medal itself shows the inundations – during the Great War. 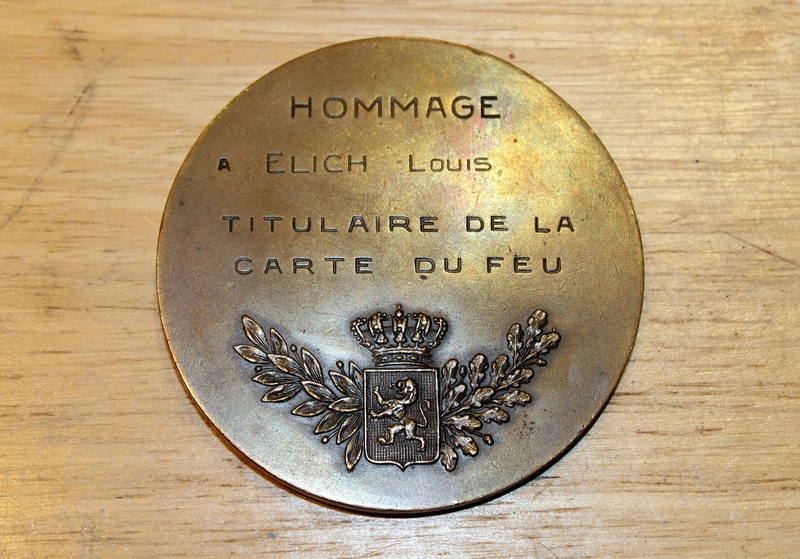 Apart from the fact that I think it is a stunning little medal, individually named, as you can see, to Louis Elich, I am also not so sure it isn’t a bit of a con. Or at least a money-making scheme. Because these did not come for free; the recipient had to buy his medal (from whom I am unsure, but it is one reason there aren’t so many around today), and it seems perhaps a little like the television adverts where Simon Weston or some other dignitary urges you to shell out a few quid for a rare commemorative medal – and only one per household, mind. Or am I being my usual cynical self? For more on Cartes de Fue ( and Yser Crosses – they had to be paid for too) here’s a spiffing link: Golden Book of the Firecard. Worth a look. And I have just discovered, since publishing this post, a little bit about Louis, which is remarkable, as he was just one of many Belgian privates. He was from Brussels, a member of 5th Regiment Genie, in 1915 tasked with maintaining and guarding, often in view of the Germans, the temporary walkways by which troops could negotiate the inundations in the area of the Trench of Death. During their tenure of this sector his regiment lost a third of their number. 6 Responses to Yser On Ne Passe Pas! Another fascinating post MJS, especially the Golden Book link. I love your comment about Simon Weston and commemorative medals. I cannot imagine who’d buy things like that – well, apart from Radio Times readers that is! Methinks we have similar outlooks, Nigel. This ‘Carte du Feu’ or ‘Vuurkaart’ (in Dutch) was made up to separate the soldiers who really were at the front from those veterans who stayed safely behind the lines during war time. The latter were called ’embusqués’. One received a ‘chevron de front’ or ‘frontstreep’ for every period of 6 months one was at the front line, thus the maximum was 8 ‘front bars’ for someone having served during the whole of the First World War. So, Louis Elich was a war veteran, who really served at the Belgian front line. He payed to be mentioned in the book (it was not cheap!). ‘Yser, on ne passe pas!’ stands for the fact that the Germans weren’t able to cross the (river) Yser during WWI. (the Belgian front stretching roughly from Nieuwpoort (Belgian coast) to close to Ypres.) You will have heard of the inundations at the Yser basin. That’s where the larger part of the Belgian soldiers served in horrible conditions. Deaths were mainly caused by malnutrition and unhygienic circumstances. Hello Filip. Check out today’s post. And thanks for the ‘each stripe was a six month tour’ info. I was unaware of that, and have included it in the new post. Louis has 7 bars and was therefore there for three and a half years. Long enough. In November last year I spent a couple of days based at Dunkirk visiting Nieupoort looking for signs of the Australian Tunnelers who worked there and some who died. A great story exists about one badly burnt Australian who after swimming the Yser to safety returned to the water to save a drowning British non swimming soldier. Walking along the river a Belgian taking photographs of seals playing told me there was a memorial to an Australian in the grounds of the nearby Lombardsijde Military Camp . After badgering the soldiers at the entry checkpoint a commander arrived in his Volvo station wagon and drove me to the memorial which is actually to a Frenchman, Lieutenant Pierre Thuret, killed 28 January 1915. Nobody in the Camp nor the information office in Nieupoort knew the story . Interesting stuff, as always, Daisy. Email received (for which thanks) and reponse in due course.